Mounting a motor on a PCB is nothing new, right? But how about making the PCB itself part of the motor? 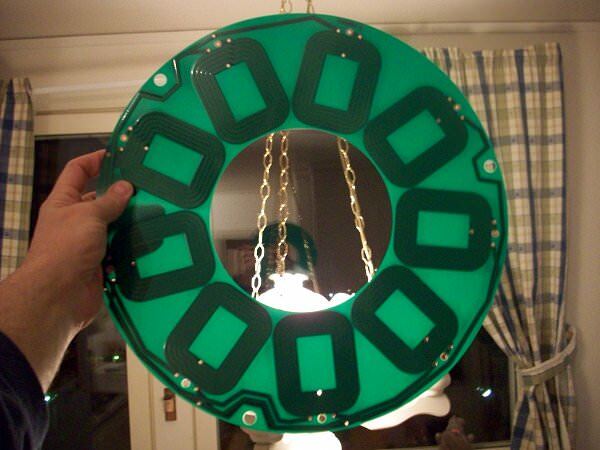 That’s what [Carl Bugeja] has done with his brushless DC motor in a PCB project, and we think it’s pretty cool. Details on [Carl]’s Hackaday.io page are a bit sparse at this point, but we’ve been in contact with him and he filled us in a little. The PCB contains the stator of the BLDC and acts as a mechanical support for the rotor’s bearing. There are six spiral coils etched into the PCB, each with about 40 turns. The coils are distributed around the axis; connected in a wye configuration, they drive a 3D-printed rotor that has four magnets pressed into it. You can see a brief test in the video below; it seems to suffer from a little axial wobble due to the single bearing, but that could be handled with a hat board supporting an upper bearing. We see a lot of potential in this design. [Carl] mentions that the lack of cores in the coil limit it to low-torque applications, but it seems feasible to bore out the center of the coils and press-fit a ferrite slug. Adding SMD Hall sensors to the board for feedback would be feasible, too — in fact, an entire ESC and motor on one PCB could be possible as well. [Carl] has promised to keep the project page updated, and we’re looking forward to more on this one. For a more traditional approach to printed motors, check out this giant 3D-printed BLDC. Very nice. This is a step on the way to drone swarms. I’ve never seen a PCB coil with more than a few turns used as anything else than a tuning circuit. PCB bldc motors with glued on coils are as old as tape drives, but this is original. I’ve designed a few low-profile switchmode supplies using planar transformers, which is where you lay out the windings in a multi-layer PC board, with cutouts to allow a ferrite transformer core to mount around the PC board. Similar concept, and you could probably work ferrite or other core material for this motor application. IIRC, we used Ferroxcube for our planar ferrite cores. They, at least at the time, did provide free samples. Might get better torque density and efficiency using a toroidal winding. There’ve been some papers in the past 25 years or so on this. Here’s one from MIT without a paywall. Add a second stacked PCB wired in reverse to interact with the back pole of the magnets, and as a bonus you’d get your second bearing mount. Or add a second stator under the pcboard. That might control the wobbling enough to not need another bearing. I believe that the wobbling problem is more of a balancing issue. The rotor is 3d printed and thus unlike metal plastic can easily bend/deform when inserting the shaft. A custom shaft would also help. Hopefully, I will fix this wobbling issue in my next prototype. It is based on “Piezo Motor Technology” so not really the same as in this article. Completely different.Its more like Canon USM drive. such PCB motors were used in compact laptop floppy stations 3 decades ago. No, they weren’t. Floppy (and many optical and HDD) drives use copper wire windings, which are fitted to a PCB like other discrete components. This project uses the PCB traces themselves for the coil. 10 seconds of googling could have spared us from your pointless comment. For low volume applications this is a nice idea, if you can live with very, very low torque. For anything in larger volumes the extra cost of some CNC wound coils would probably be justified because you’ll get a much better motor. Hi everyone thanks for the kind comments about my project. This motor has a 4-layer pcb stator which like a normal wounded motor rotates the rotor. The cd/floppy/tape drives mentioned in some comments above still have a wire wounded motor. The stator I designed is solid-state meaning that it is printed on the board and traces act as the coil. are you aware of halbach arrays? you are in a pancake configuration, so you could try a coreless system. Yeah, it’s been done before. I also had some ancient thin form factor floppy drives which used this. It’s still a well executed project with potential to advance the public knowledge of the subject. Thanks for the info! The patent is a bit different from what I have designed but still fall in the PCB stator category. Nevertheless, I’m not planning to sell this idea, I’m more interested in open sourcing it and making the technology more accessible. Some of the latest battery powered weed eaters are doing this same thing. The controller and battery pack are in the plastic housing where the engine used to be. Wires run through the shaft, the head actually is a large pcb with several sensors and other stuff for turning the plastic wire blades. We did a tear down of one a few years ago to see what was going on, do some quotes. We were (they probably still are) targeting larger traction motors in the 75 to 200kW range. Would anything to be gained by using a double sided PCB and a large number of vias to make a vertically wound coil. would there be any benefits to having magnets on the back side to? Though with a design like this you could get more power by adding additional PCB’s&rotors as long as you can keep the rotor magnets aligned right, not to mention that the additional bearings in the PCB’s might help keep the axel from wobbling…..though bearing strength/mounting, PCB connections and the housing that all of this would fit into (if any?) would effect that as well. If you start with magnets you might as well also do a normal coil, and then you have nothing special anymore. Hi those motor uses piezo technology which different from what I have called PCB motor. Super cool project. And kudos to not only having the idea, but getting it to work this well. Is it a problem that the iron cores, normally present in a bldc, are lacking? Would it make sense to insert them into the middle of the coils? Hi Steve thanks for your comments! Adding iron cores would definitely increase the motor’s torque but the idea behind this project is to have a very cheap brushless motor. These type of motor is commonly used to drive a drone’s propeller which requires high speed and a low torque. would the cores affect the efficiency? Yes adding the cores would yield better efficiency but require much more area. I used to design voice coil motors (different thing, same physics) professinally and there is one more thing to consider when not putting in any iron: the magnets working point. Without any iron, the magnet has to ‘work hard’ to push the field through space. This becomes a problem when using low temperature magnets (i.e. not ‘H’ or at least ‘M’ grade) because the coercivity depends both on temperature and working point. What this means is that parts of the magnet can be de-magnetized when the motor runs hot so it can lose efficiency and torque. Just a heads up ;) great desigh though, cudos! Something very similar is used in flex prints inside of mobile phone cameras (iPhone image sabilization for example) but much more tiny and a completely different purpose, but still similar. Hi :) Thanks for your advice! This is like every floppy PCB made between the mid to late 80’s and now… Why is it that people see something on the internet that they haven’t seen before, and assume that because *they* haven’t seen it, it must be new? Hi Nato! Floppy disk motors have wire wounded stators just like any other motor.This motor that I designed has a 4-layer pcb stator meaning that the pcb’s tracks are being used as the motor’s coil. I highly suggested you do some research before commenting. I guess I shouldn’t be surprised that you don’t know this. It seems that this site caters to viewers which do not question the statements made in the writeups. PCB stator coils are nothing new; There has been significant research put in to this over the past decade or so. There are many products which use this technology. There are numerous research papers, bench test analysis results, etc which study and compare torque capabilities vs. PCB coil design, noise vs. design, etc. Why do you care if it’s “new” or not? Why does your definition of “new” (meaning, it’s similar enough to something you’ve seen that you discount any differences) matter to anyone else? If the board were designed with a via in the right place, then the rotor could be more definitively supported simply by putting one bearing on top and a second bearing on the bottom. Hi, is your design patented or is there an existing patent? Have you managed to solve the heat generated issues?